Medium Gift Basket 5 PCS. 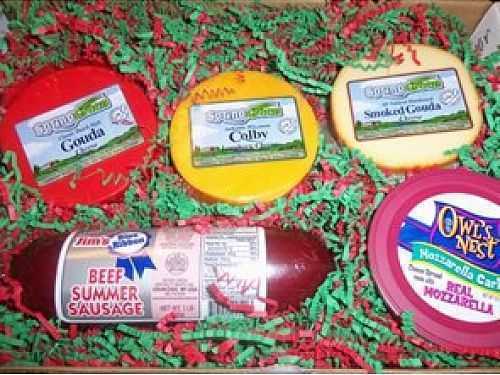 Create your own gift box with your choice of cheese and sausage products. Please Select...Jims Sausage 14 oz. Old Wisconsin 9 oz. Sausage 10 oz. Owl's Nest Cheddary 10 oz. Owl's Nest Cheese Spread - Garlic 10 oz. Owl's Nest Cheese Spread - Horseradish 10 oz. Owl's Nest Cheese Spread - Port Wine 10 oz. Owl's Nest Cheese Spread - White Cheddar 10.25 oz. Sweet & Hot Honey Mustard Regular String Cheese Smoked String Cheese Bacon Cheese 1 lb. Sriracha Jack 1 lb. Brick - Mild 1 lb. Brick - Medium 1 lb. Cheddar - Mild 1 lb. Cheddar - Medium 1 lb. Cheddar - Smoked 1 lb. Cheddar - Merlot 1 lb. Cheddar - Black & Green Olive 1 lb. Cheddar - Chipolte 1 lb. Cheddar - Tomato Basil 1 lb. Cheddar - White Sharp 1 lb. Pimento Colby 1 lb. Colby Caliente 1 lb. Colby Deli 1 lb. Colby Jack 1 lb. Colby Jack Deli 1 lb. Fresh Cheese Curd- Pizza 12 oz. Fresh Cheese Curd 12 oz. Fresh Cheese Curd - Cajun 12 oz. Fresh Cheese Curd - Dill 12 oz. Fresh Cheese Curd - Garlic & Herb 12 oz. Garlic Colby Jack 1 lb. Gouda 1 lb. Gouda - Smoked 1 lb. Imported Dill Havarti 1 lb. Limburger 8 oz. Lite Farmers Cheese 1 lb. Mozzarella Part Skim 1 lb. Muenster 1 lb. Muenster - Caraway 1 lb. Onion Cheese 1 lb. Pepper Jack Deli 1 lb. Provolone 1 lb. Provolone - Smoked 1 lb. Salami Cheese 1 lb. Smokey Swiss & Cheddar 1 lb. Swiss - Baby - Full Cream 1 lb. Swiss - Medium 1 lb. Vegetable Jack 1 lb. Waxed 4 oz. Cow Waxed 4 oz. Mouse Waxed 4 oz. WI Shape 3.4 oz Ritz Cracker Blueberry Goat Cheese 4oz. Raspberry Bellavitano 5.3oz Honey Goat Cheese 4 oz. Please Select...Jims Sausage 14 oz. Old Wisconsin 9 oz. Sausage 10 oz. Owl's Nest Cheddary 10 oz. Owl's Nest Cheese Spread - Garlic 10 oz. Owl's Nest Cheese Spread - Horseradish 10 oz. Owl's Nest Cheese Spread - Port Wine 10 oz. Owl's Nest Cheese Spread - White Cheddar 10.25 oz. Sweet & Hot Honey Mustard 8 oz. String Cheese 8 oz. Smoked String Cheese Bacon Cheese 1 lb. Sriracha Jack 1 lb. Brick - Mild 1 lb. Brick - Medium 1 lb. Cheddar - Mild 1 lb. Cheddar - Medium 1 lb. Cheddar - Smoked 1 lb. Cheddar - Merlot 1 lb. Cheddar - Black & Green Olive 1 lb. Cheddar - Chipolte 1 lb. Cheddar - Tomato Basil 1 lb. Cheddar - White Sharp 1 lb. Pimento Colby 1 lb. Colby Caliente 1 lb. Colby Deli 1 lb. Colby Jack 1 lb. Colby Jack Deli 1 lb. Fresh Cheese Curd- Pizza 12 oz. Fresh Cheese Curd 12 oz. Fresh Cheese Curd - Cajun 12 oz. Fresh Cheese Curd - Dill 12 oz. Fresh Cheese Curd - Garlic & Herb 12 oz. Garlic Colby Jack 1 lb. Gouda 1 lb. Gouda - Smoked 1 lb. Imported Dill Havarti 1 lb. Limburger 8 oz. Lite Farmers Cheese 1 lb. Mozzarella Part Skim 1 lb. Muenster 1 lb. Muenster - Caraway 1 lb. Onion Cheese 1 lb. Pepper Jack Deli 1 lb. Provolone 1 lb. Provolone - Smoked 1 lb. Salami Cheese 1 lb. Smokey Swiss & Cheddar 1 lb. Swiss - Baby - Full Cream 1 lb. Swiss - Medium 1 lb. Vegetable Jack 1 lb. Waxed 4 oz. Cow Waxed 4 oz. Mouse Waxed 4 oz. WI Shape 3.4 oz Ritz Cracker Blueberry Goat Cheese 1 lb. Merlot Bellavitano 1 lb. Please Select...Jims Sausage 14 oz. Old Wisconsin 9 oz. Sausage 10 oz. Owl's Nest Cheddary 10 oz. Owl's Nest Cheese Spread - Garlic 10 oz. Owl's Nest Cheese Spread - Horseradish 10 oz. Owl's Nest Cheese Spread - Port Wine 10 oz. Owl's Nest Cheese Spread - White Cheddar 10.25 oz. Sweet & Hot Honey Mustard 8 oz. String Cheese 8 oz. Smoked String Cheese Bacon Cheese 1 lb. Sriracha Jack 1 lb. Brick - Mild 1 lb. Brick - Medium 1 lb. Cheddar - Mild 1 lb. Cheddar - Medium 1 lb. Cheddar - Smoked 1 lb. Cheddar - Merlot 1 lb. Cheddar - Black & Green Olive 1 lb. Cheddar - Chipolte 1 lb. Cheddar - Tomato Basil 1 lb. Cheddar - White Sharp 1 lb. Pimento Colby 1 lb. Colby Caliente 1 lb. Colby Deli 1 lb. Colby Jack 1 lb. Colby Jack Deli 1 lb. Fresh Cheese Curd- Pizza 12 oz. Fresh Cheese Curd 12 oz. Fresh Cheese Curd - Cajun 12 oz. Fresh Cheese Curd - Dill 12 oz. Fresh Cheese Curd - Garlic & Herb 12 oz. Garlic Colby Jack 1 lb. Gouda 1 lb. Gouda - Smoked 1 lb. Imported Dill Havarti 1 lb. Limburger 8 oz. Lite Farmers Cheese 1 lb. Mozzarella Part Skim 1 lb. Muenster 1 lb. Muenster - Caraway 1 lb. Onion Cheese 1 lb. Pepper Jack Deli 1 lb. Provolone 1 lb. Provolone - Smoked 1 lb. Salami Cheese 1 lb. Smokey Swiss & Cheddar 1 lb. Swiss - Baby - Full Cream 1 lb. Swiss - Medium 1 lb. Vegetable Jack 1 lb. Waxed 4 oz. Cow Waxed 4 oz. Mouse Waxed 4 oz. WI Shape 3.4 oz Ritz Cracker Blueberry Goat Cheese 1 lb. Raspberry Bellavitano 1 lb. Please Select...Jims Sausage 14 oz. Old Wisconsin 9 oz. Sausage 10 oz. Owl's Nest Cheddary 10 oz. Owl's Nest Cheese Spread - Garlic 10 oz. Owl's Nest Cheese Spread - Horseradish 10 oz. Owl's Nest Cheese Spread - Port Wine 10 oz. Owl's Nest Cheese Spread - White Cheddar 10.25 oz. Sweet & Hot Honey Mustard 8 oz. String Cheese 8 oz. Smoked String Cheese Bacon Cheese 1 lb. Sriracha Jack 1 lb. Brick - Mild 1 lb. Brick - Medium 1 lb. Cheddar - Mild 1 lb. Cheddar - Medium 1 lb. Cheddar - Smoked 1 lb. Cheddar - Garlic and Dill 1 lb. Cheddar - Black & Green Olive 1 lb. Cheddar - Chipolte 1 lb. Cheddar - Tomato Basil 1 lb. Cheddar - White Sharp 1 lb. Pimento Colby 1 lb. Colby Caliente 1 lb. Colby Deli 1 lb. Colby Jack 1 lb. Colby Jack Deli 1 lb. Fresh Cheese Curd- Pizza 12 oz. Fresh Cheese Curd 12 oz. Fresh Cheese Curd - Cajun 12 oz. Fresh Cheese Curd - Dill 12 oz. Fresh Cheese Curd - Garlic & Herb 12 oz. Garlic Colby Jack 1 lb. Gouda 1 lb. Gouda - Smoked 1 lb. Imported Dill Havarti 1 lb. Limburger 8 oz. Lite Farmers Cheese 1 lb. Mozzarella Part Skim 1 lb. Muenster 1 lb. Muenster - Caraway 1 lb. Onion Cheese 1 lb. Pepper Jack Deli 1 lb. Provolone 1 lb. Provolone - Smoked 1 lb. Salami Cheese 1 lb. Smokey Swiss & Cheddar 1 lb. Swiss - Baby - Full Cream 1 lb. Swiss - Medium 1 lb. Vegetable Jack 1 lb. Waxed 4 oz. Cow Waxed 4 oz. Mouse Waxed 4 oz. WI Shape 3.4 oz Ritz Cracker Blueberry Goat Cheese 1 lb. Raspberry Bellavitano 1 lb.